The winners of the 2019 RSEQ-Lilly Awards for PhD students have just been announced. 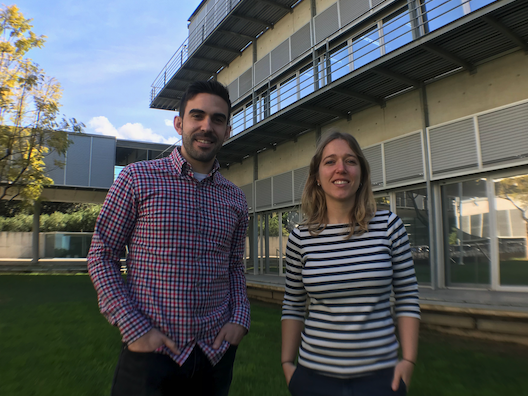 This year, for the first time, two ICIQers have won the award: Ana García Herraiz (M. G. Suero group) and José Enrique Gómez (Kleij group), while the third award goes to Esther Sánchez Tirado, from Universidad Complutense de Madrid. Ana G. Herraiz works on the development of novel carbon-based reactive species for the discovery of new reactivity at carbon through photoredox catalysis for the modification of feedstock chemicals and medically relevant agents. José Enrique Gómez studies the stereoselective synthesis of sulfones and amino acids from functionalized heterocycles, he is utilizing a catalytic post-modification strategy for the functionalization of organic carbonates into products of pharmaceutical relevance. As a recognition for the award, the three awardees will present their work in an invited oral presentation during the XXXVII Biennial Meeting of the RSEQ, which will take place in Donostia in May. The Biennial Meeting will also feature talks by the 2019 winners of the RSEQ Young Researcher award, and the keynote lecture will be delivered by Frances Arnold, 2018 Chemistry Nobel laureate. With these awards, Lilly recognises research excellence and the link between the academic field and the pharmaceutical industry. In previous years, other ICIQ PhD students have been awarded this distinction: Nicolas Marion (Nolan’s group, 2006); Elena Herrero (Echavarren’s group, 2008); Patricia Pérez (Echavarren’s group, 2009); Anna Homs (Echavarren’s group, 2014); Xueqiang Wang (Martin’s group, 2015); Cayetana Zárate (Martin’s group, 2016); and Eloísa Serrano (Martin’s group, 2017).